Ninety-nine percent of the researchers at IMFAR are the nicest, most well-meaning scientists one could ever meet, which makes for a friendly atmosphere. We were happy to see significant progress on some research fronts: only a single presentation about vaccines, and it was not about causality at all -- but was instead a poster on how lingering hoax-based vaccine-autism fears affect the immunization status of autistic kids' younger siblings. More researchers used social media to speak out publicly about implausible science -- often live, while the implausible presentations were happening. More sessions focused on autistic quality of life, and more sessions were led by or featured autistic speakers. We were grateful to see sessions on how autistic people can contribute to research, girls and gender, what adult autistic people need and aren't getting, a "reality check" about autism research and outreach in impoverished communities, sensory sensititivities, suicidality, understanding racial and cultural differences, anxiety, communication, adult services, and how little we know about autism and ageing. All good things, all good things. What remained not-good is how IMFAR 2016 represented skewed priorities and proportions in autism research. While we are all for scientific curiosity, we observed too much emphasis on causation, too many animal models, too much focus on normalizing autistic people instead of understanding their needs -- compared to investigations into improving the lives of existing autistic people. That balance needs to shift. Autistic people were still mostly talked about with ableist language and medical model speak, which is a problem -- and indicative, to us, of how much autistic people continue to be sidelined: talked about, instead of included, in autism discussions. I'd like researchers to consider the effects of spending one's life under "the clinical gaze," as NeuroTribes author Steve Silberman puts it, and how such implicit negativity about autism factors into closeted and undiagnosed autistic autism researchers remaining hidden. An example of lopsided autism research priorities was, unfortunately, the IMFAR 2016 press conference. Such bias is not merely concerning but distressing, given that the press conference presentations are often the only coverage IMFAR gets from the mainstream media. The first press conference presenter was Dr. Dani Fallin, who "suggests excess levels of folate (folic acid) supplements in some pregnant women increases the risk of ASD twofold. We were openly unimpressed, given that it's already understood (as well as covered in Emily Willingham's and Tara Haelle's new book The Informed Parent) that both under- and over-dosing on folic acid is problematic for fetal neural development. The Atlantic's reaction was more blunt, staying "Concerns About Folate Causing Autism Are Premature." Yet the study was taken at face value by, and covered at length on, major media outlets -- including local Baltimore radio. Next was Dr. Jason Wolff's and Dr. Jed Elison's "Restricted Behavior and Brain Functional Connectivity in Infants and Toddlers at Risk for Developing Autism Spectrum Disorder." While yes, it would be cool to have a tool (fMRI in this case) to diagnose autistic kids during toddlerhood so they can start being supported right away, it was amusing to see the researchers recognize that a "greater proportion of 18 month old boys in general show more intense interests." What I found most interesting about this study was an aspect that was not emphasized during the press conference, regarding its cohort: "Children were classified as high risk (HR) if they had a sibling with ASD, or low risk (LR) if they had at least one sibling without ASD and no 1st or 2nddegree relatives with ASD." Implicit recognition that autism is both genetic and heritable FTW. Then Dr. Renee Gardner presented findings on how maternal inflammation during pregnancy increases likelihood of a baby being autistic. This is also largely unsurprising -- we know autism is inborn, we know there are a huge constellation of genes involved, we know from twin studies that it's prenatal factors may increase the likelihood of those constellations coming together and resulting in autism, and we know that maternal illness or infection can affect fetal neurology and development. "In the US, 42 states have passed autism insurance mandates that require commercial insurance plans to pay for autism-related services. These mandates have not been rigorously evaluated. The few studies of the mandates have not assessed their effects directly on the number of children diagnosed with autism or the services they received as a result of the mandates." We are all for evaluating policy for effectiveness, especially with regards to outcomes, and so don't have specific concerns about Mandell's study itself. We do worry that "autism-related services" usually means Applied Behavioral Analysis (ABA) or similar behaviorally-based, normalization-geared therapies, the complicated problematics of which are generally ignored by autism research. "Our work suggests that at least a subgroup of individuals with chronic repetitive SIB may be in a physiological state similar to neuropathic pain / hyperalgesia associated with alterations in inflammatory, immune, and nociceptive systems. If so, this may provide a set of accessible, objective biomarkers of altered sensory function that may help identify the need for treatment and perhaps also mark the course of treatment response in this vulnerable but under-researched subgroup." Knowing how to identify and harness biomarkers is not a bad thing (though, as Sue Fletcher-Watson notes, the term "biomarker" is not always correctly harnessed by autism researchers). But, again, the research team could also have tapped into one of the frequent autistic-inclusive discussions on fluctuating and atypical responses to pain, especially as this is an autistic commonality affecting people of all abilities. Even though Bodfish acknowledged that insufficient communication options may contribute to the difficulty of properly evaluating autistic pain, he did not cover how being unable to effectively communicate can lead to frustration and thus to increased self-injury, or that maybe it could decrease self-injury if the subjects had a working communication system. 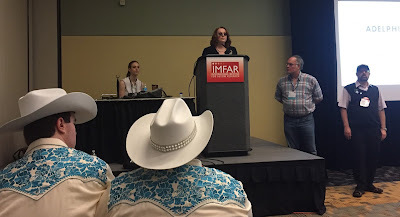 The press conference was followed by the IMFAR 2016 opening night reception, which was wonderful in terms of randomly connecting with wonderful people, but which was also held in the loudest ballroom ever. We kept stepping outside and talking with people in the hallways instead (and noticed many autistic attendees doing the same). "With an accessibility approach, accommodations are integrated into a space — say, an annual conference — and not particularized to an individual. Most important, the burden shifts from the individual to society." "I would similarly urge caution to those attending and covering the meeting in reporting the environmental associations being presented. For example, several speakers focused on pesticides, but the best available data suggest the strength of any true association specifically between pesticides and autism is less than for inter-pregnancy intervals and much less than for age of parents." So thank heavens for the Spectrum-hosted top-notch State of Autism Science discussion IMFARChat, which took place both on Twitter and in the press room, and touched much more on areas of need in research: underserved populations, quality of life, increasing autistic participation in research, and on addressing concrete issues rather than the distractions of abstractions. IMFAR 2016 day two was an improvement. We especially enjoyed the panel on research, under diagnosis, testing bias, and self-advocacy in autistic females (or really, in those who don't identify as male), featuring The Autistic Self Advocacy Network's Deputy Executive Director Julia Bascom. And which opened with quotes from TPGA's own How Can We All Do Better By Our Autistic Girls? article, which was cool. For details and reactions, see our our Session Storification. We also enjoyed getting to spend most of the day hanging out with that same Julia, and getting her insights on many autism matters. Then the "many conflicts" theme continued. We missed Dr. Lisa Croen's session on autistic adults and health care utilization, damn it, but hope to follow up with her. We also missed Dr. Sarah Cassidy's Special Interest Group on autism and suicidality, but were lucky enough to catch her and interview her alongside Julia Bascom and UCLA researcher Steven Kapp. The third and final conference day was stellar. We made it to a 7:15 AM Special Interest Group (SIG) on Incorporating Autistic Intellect in Research Design and Evaluation, in which Dena Gassner, Dr. Stephen Shore, Alexa Pohl, and John Elder Robison discussed the importance of including autistic people in all areas of the autism research process. (See our Storified panel summary for coverage.) The session was well-attended, and so lively that no one wanted it to end. Hopefully the discussion will continue anew, and soon. Of note is that Alexa Pohl's autistic collaborator Monique Blakemore, who was the Autistic Intellect SIG's inspiration, was not able to attend IMFAR due to funding hurdles. Conference organizers need to start addressing (perhaps with a ... study?) the multifactorial barriers for autistic IMFAR attendees. Next was Dr. Paul Shattuck's excellent keynote on the need to “move the needle” on adult outcomes, specifically determining the kinds of research and tracking tools that might influence widescale changes in those outcomes. Dr. Shattuck then chaired a panel on autistic life courses and "ecological perspectives," including Collaborative Networks Among Parents and Autism Intervention Providers, Adults with Autism Spectrum Disorders Post High School, Training Parents to More Effectively Navigate the Adult Service System, and TPGA contributor and autistic researcher Steven Kapp's incredible Toward Social Acceptance of Autism: Listening to Autistic People. We appreciate IMFAR, even though it usually takes us a week or more to recover from IMFAR. Overall, we are optimistic about the increased attention to autistic quality of life, underserved populations, and lifespan issues, though we'd like to see more emphasis on functional communication, co-occurring conditions, and autistic inclusion, and, and, and. For a list of autism-related topics autistic people themselves discuss and want addressed, please (please) look through the #AutChat archives. Please also note that as laypeople trying to make sense of autism research, we relied heavily on the live observations of autism science professionals like Spectrum News's science writing team, Chris Gunter, Sue Fletcher-Watson, Steven Kapp, and Lorcan Kenny. See you in San Francisco next year! 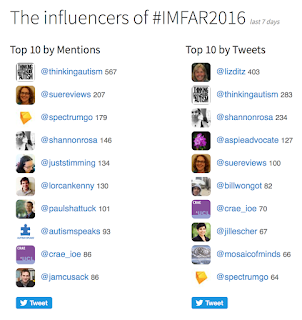 We were quite the IMFAR 2016 social media influencers, it seems. Imagine our numbers if we'd actually been able to attend all the sessions we wanted to attend. 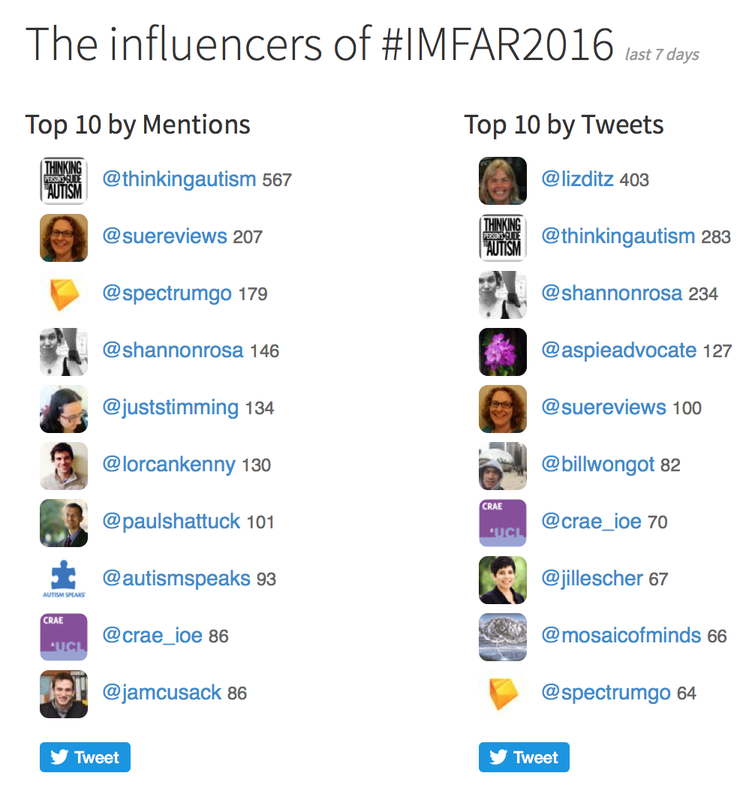 [image: chart showing the top 10 IMFAR 2016 influencers on Twitter.